Vice Mayor Peggy Chapados borrowed one from David Letterman as she retired from the Maricopa City Council after six years Tuesday night. At Tuesday’s regular city council meeting, Mayor Christian Price said Chapados is one of the “kindest people” he knows. “We may not always agree with her, but you know where she stands. She is always thinking of other people in one fashion or another. If you know Peg at all, you know she is one of the most organized people you will ever meet. 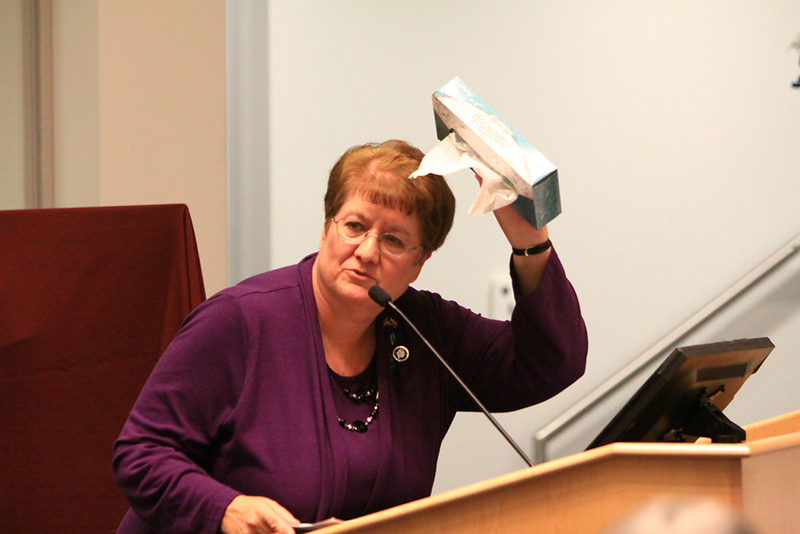 So, to go away – of course she has a PowerPoint presentation. You think I’m kidding but she has one. Take it away,” Price said. 10. Be a public servant. 9. You don’t know what you don’t know. 8. Preparing for government is something like an iceberg – you only see what’s on the surface. 7. The meetings are the easiest part of this job. 6. It’s not about me, it’s about my city. 4. It’s about building something positive. 3. You can’t do this job alone. 2. 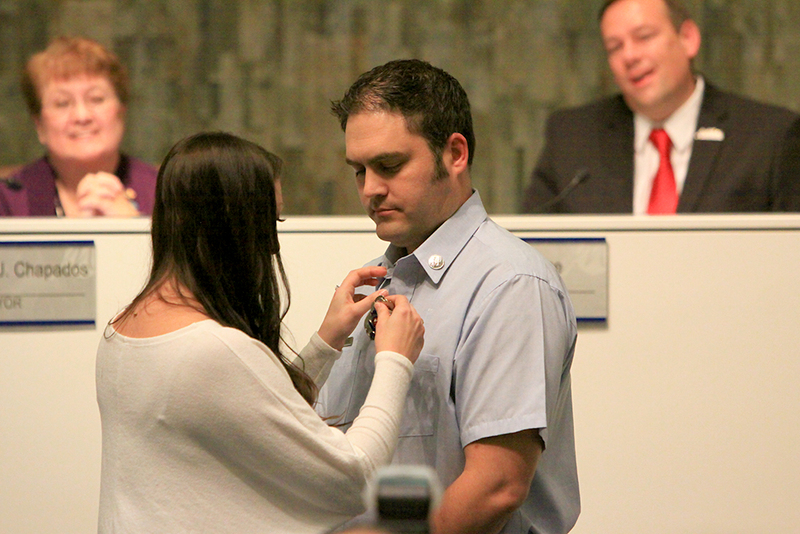 Maricopa has the greatest volunteers, staff, public safety personnel, executive team and city manager. 1. 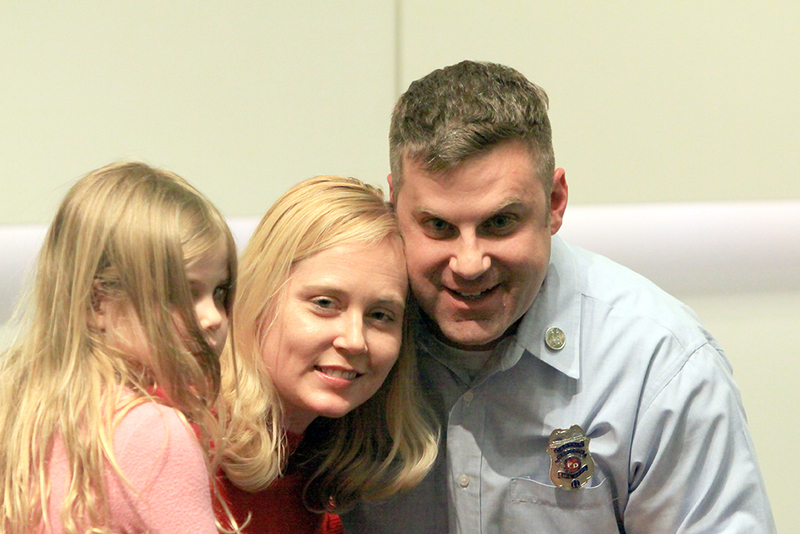 This is the best job I’ll ever have – so thank you. 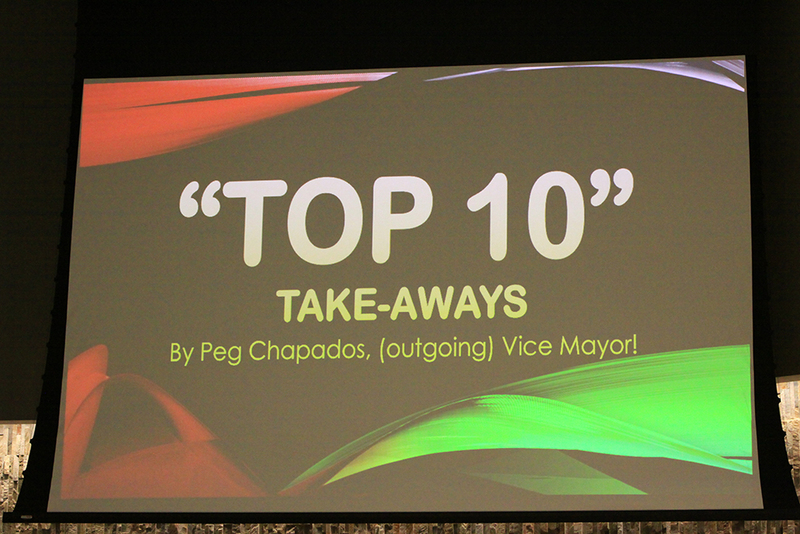 Following a standing ovation, Chapados personally thanked those who helped her during her six years on the city council, past and present. “My fellow council members, thank you for the privilege of serving with you. We made a lot of great decisions here and we got a lot accomplished. We should be proud,” Chapados said. She also thanked the voters of Maricopa for putting their faith in her and electing her to office. 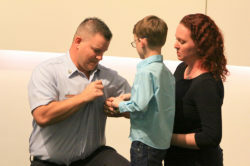 The city fire department presented Chapados with a bronze firefighter figure and made her a lifetime honorary member of the Maricopa Fire/Medical Department. 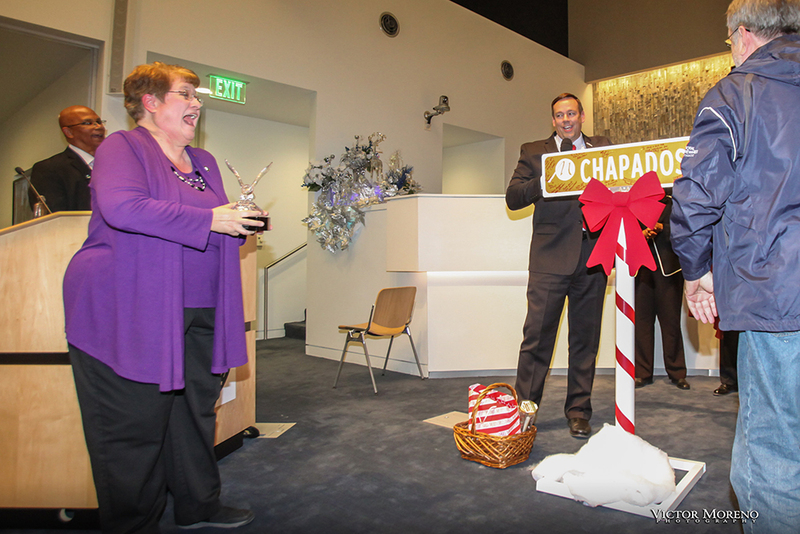 Council members presented Chapados with a custom-made Maricopa street sign with the street name of “Chapados Way” on it. 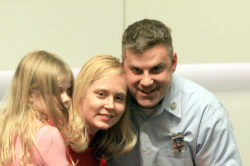 They also presented her with a “basket of snacks” and a cat-themed Christmas sweater. 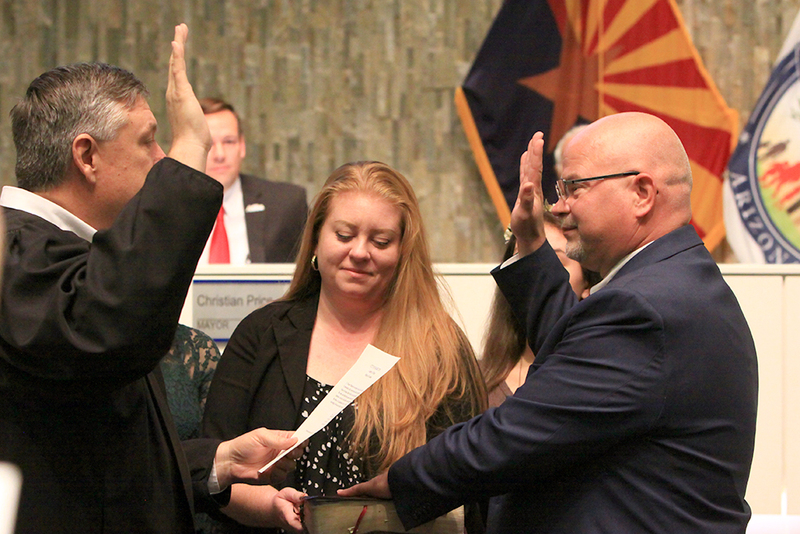 Following her farewell, re-elected members of the council Vincent Manfredi and Henry Wade were sworn into office by the Honorable Judge Lyle Riggs along with Rich Vitiello, who is replacing Chapados on the board. The council stopped its regular meeting for a short reception in the lobby to celebrate the swearing-in ceremonies with cookies and lemonade. Besides the consent agenda and some presentations and reports, the only thing on the council’s agenda was the re-zoning of three tracts of land in the Copper Sky Development. While zoning changes might be important, these three changes don’t really change the zoning of the land very much, according to Maricopa Senior Planner Rodolfo Lopez. Instead the changes simply modernized wording to update the properties from old to new zoning codes. There are no proposed development plans for the property at this time, according to Lopez. There was no discussion about the zoning changes by members of the council on Tuesday evening as they approved the measures. One matter at the end of the zoning changes did allow the city to modify the maximum height of buildings allowed in the city from 40 to 60 feet. The change was approved by the council unanimously with little discussion. 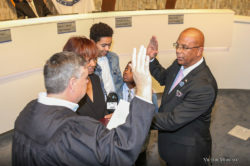 At the end of the meeting, board member Marvin Brown, a former vice mayor, nominated Henry Wade as vice mayor, and the council voted 7-0 to approve his nomination. Prior to Chapados’ exit, the city council opened Tuesday’s meeting with a pinning ceremony for the city fire department promotions of Brad Pitassi and Joshua Eads to the rank of captain and Justin Henzel to engineer. 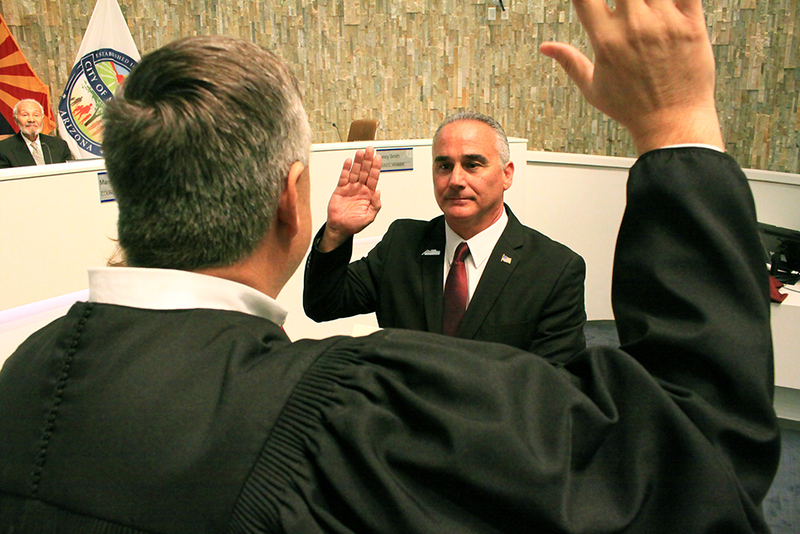 Vincent Manfredi is minority owner of InMaricopa.